Funeral services honoring Doreen’s life will be held on Tuesday, December 4, 2018. A Mass of Christian Burial will be celebrated at 11:00 a.m. at St. Mary’s Catholic Church, 7400 39th Avenue. Interment will follow at St. James Cemetery. A visitation for Doreen will be held at the church, 7400 39th Avenue from 9:30 a.m. until the time of Mass. 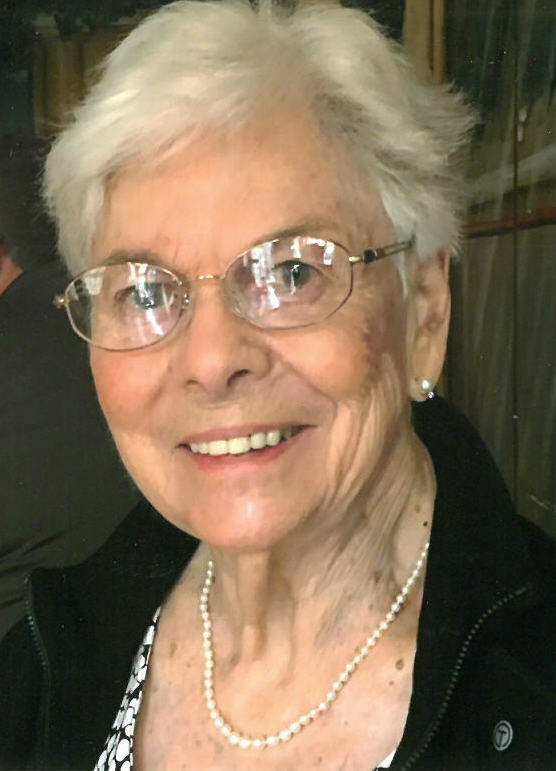 In lieu of flowers, Doreen’s family would appreciate memorial remembrances to St. Mary’s Catholic Church, 7307 40th Ave., Kenosha, WI 53142 or St. Joseph’s Catholic Academy, 2401 69th St., Kenosha, WI 53143. Doreen Marie (nee: Deakin) Theriault, finally got her wish to join her beloved husband, Jack in heaven on Tuesday, November 27, 2018. She passed away at Froedtert South – St. Catherine’s Hospital Campus, surrounded by her loving family. Doreen Marie was born on August 3, 1925 in Sault Ste. Marie, Ontario, the daughter of the late Herbert and Hazel (Fitzpatrick) Deakin. She lived in Detroit, Michigan for seven years until the death of her father. Then, she and her mother moved to Sault Ste. Marie, Michigan where she attended Loretto Academy and Sault Ste. Marie High School, graduating in 1943. She graduated from Cleary College in Ypsilanti, Michigan in 1944. Doreen then worked at Beyer Memorial Hospital in Ypsilanti as a Secretary for several years prior to going to work at Ford Motor Co. as a Personal Secretary to the Manager of Plant Engineering at the Ypsilanti Plant. On April 7, 1947 (Easter Sunday), Doreen married the absolute love of her life, Robert J. “Jack” Theriault, Sr. at St. John’s Catholic Church in Ypsilanti. They were very happily married for over 67 years. They initially moved to Waukegan, Illinois for a few years and then in 1956 to their final destination, Kenosha, WI where Doreen was a homemaker and loving mother for their four children, Bob, Ann Marie, Mary, and Alison and later a devoted grandmother and great-grandmother. She was a member of St. Mary’s Catholic Church and the Women’s Altar Society. She was also a dedicated volunteer at St. Catherine’s Hospital for twelve years working at the Information Desk. Doreen was an accomplished pianist in her younger years. In her later years, she thoroughly enjoyed working on crossword puzzles, jigsaw puzzles, playing the piano and bridge. She and her husband, Jack, enjoyed traveling with the family on vacations to such places as New York, Las Vegas, and Florida. Most of all, Doreen loved spending time with her children, grandchildren, and great-grandchildren. Doreen is survived by her four children, Bob (Pat) Theriault, Ann Marie (Kenny) Yorgensen, Mary (Peter) Wasilevich, and Alison (Marv) Jenkins; and her eight grandchildren, Terri (Dave) Soutor, Kurt (Jen) Theriault, Scott (Jodi) Theriault, Jill (Aaron) Vitkus, Jeff Jenkins, Brady (Stacie) Jenkins, Lauren Yorgensen and Jason (Christal) Yorgensen. Doreen is also survived by her thirteen great-grandchildren, Adam Reden, Jack and Avery Theriault, Zoe Theriault, Aaron, Caleb, Josiah, Macie and Max Jenkins, Katelyn, Madelyn and Matthew Vitkus and Tanner Yorgensen. Doreen’s family would like to extend a warm and sincere thank you to the Brookside Care Center staff, nurses, and aids that lovingly cared for Doreen this past year. Your devotion to Doreen’s wellbeing will always be remembered with gratitude and a smile.